I'm available to teach hammered dulcimer privately anyone age 10 or older who has an instrument and can bring it to my home in South Anchorage on a regular basis. If you don't own an instrument, I might be able to arrange a rental. Lessons are $35/hour or $20/half hour. 1. Read these notes please, before you start. 2. Download the free Flash Plug-In if you don't already have it. 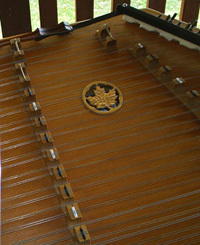 Check back for more virutal dulcimer lessons coming soon.